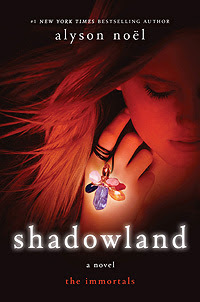 Shadowland was written by Alyson Noel. It is book 3 in The Immortal series. Ever and Damen have traveled through countless past lives—and fought off the world's darkest enemies—so they could be together forever. But just as their long-awaited destiny is finally within reach, a powerful curse falls upon Damen...one that could destroy everything. Now a single touch of their hands or a soft brush of their lips could mean sudden death—plunging Damen into a bleak afterlife in the Shadowland, an eternal abyss for lost souls. Desperate to break the curse and save Damen, Ever immerses herself in magick—and gets help from an unexpected source...Jude Knight. The series really starts to focus on past lives, karma and fate. There is a long running love triangle between Damon, Ever and Jude. Like other novels (ahem, Twilight) there is a struggle for Ever to try and decide who her true "soul mate" is.